This is the public profile of Gellért Ollé, Additional information and high-resolution images are available for accredited press members, to access additional information about Gellért Ollé please login as a press member. About Gellért Ollé : The designer graduated as a product designer in 2015 after which he continued his studies attending a Furniture Design MA. Over the years, he had the op¬portunity to explore various design disciplines ranging from ceramic design and experimental design to public installations, product design and furniture design. He also studied 3D printing technology. He specialise in furniture design and anything related to timber. 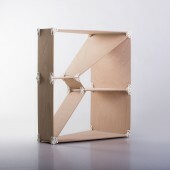 However, he believes that design is neither about the product nor the material, but about how someone looks at the world. Press Members: Request an exclusive interview with Gellért Ollé.